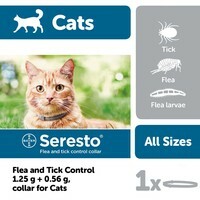 Seresto Flea and Tick Control Collar for Cats provides efficient protection against flea, tick and lice infestations for up to 8 months in a single application. The collars have been designed to release their active ingredients at a slow and steady rate via the innovative polymer matrix to ensure a long lasting efficacy; eliminating the need for more frequent top up treatments. Seresto Flea and Tick Control Collars are odourless, water-resistant and easy-to-apply. Just pop it on your cat for 8 months of protection.